I’ve spent the last 5 years building a Visual Art and Digital Media department at a small New Orleans public charter school. I was initially hired to teach the Art 1 class required to fill graduation requirements. Since then, I’ve worked and advocated for adding 2 additional teachers and 7 additional class offerings to create a robust art program. Now our department offers 2 pathways which include Art 1, Art 2, AP Studio Art Portfolio, Printmaking, Arts Administration and Business, Digital Photography, Digital Storytelling and Graphic Design. The majority of my high school students have had very little visual art experience when they begin Art 1. My goal is always to provide a challenging environment and differentiated curriculum that rewards risk taking, and allows space for failure as a means for growth. The process of pushing through fear of failure empowers students to step out of their comfort zones and take risks throughout their lives. Through Visual Art, they become curious, creative, life long learners who have a genuine appreciation for difference and diversity. My students study and discuss a culturally diverse range of artists, both historical and contemporary. As a result, students explore ways other artists have conveyed ideas visually and make personal connections to their own studio work. I use socially oriented, theme based projects, related to students’ lives, to challenge each student at her/his skill level and encourage critical thinking. 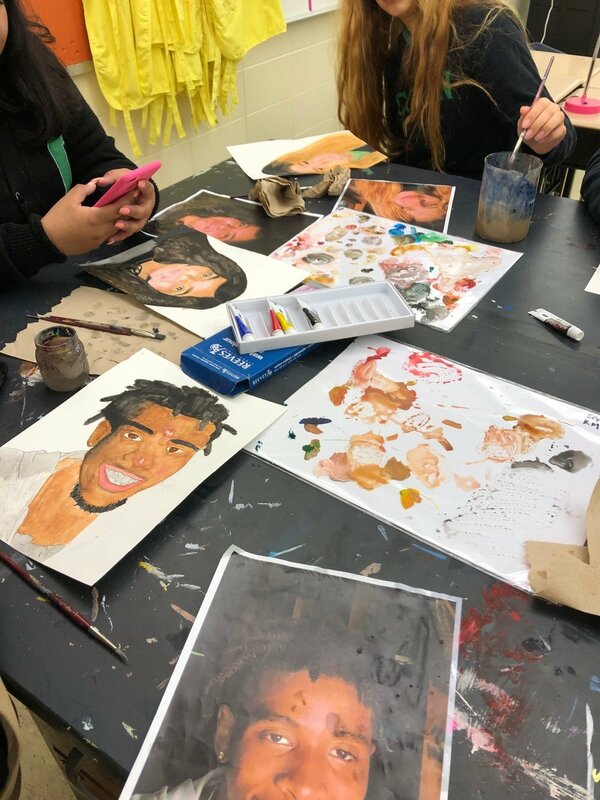 Students use drawing, painting, printmaking, collage, sculpture, photography, and graphic design to visually express social and academic concepts.